As technology becomes a fixed presence in our homes, we are faced with the decision as to whether we style tech into our homes or, as many people end up doing, our homes around our tech. Let’s be honest, we can all relate to Joey’s question, “What’s all your furniture pointed at?” when contemplating a TV-free zone. Whether we like it or not, our rooms – especially our living rooms – are becoming their own mini solar systems with sofas, chairs and coffee tables all orbiting around our TV screens. Sonos’ design ethos has always been focused on defying the idea that technology has to stand out or dominate our home interiors…well, until their collaboration with HAY. 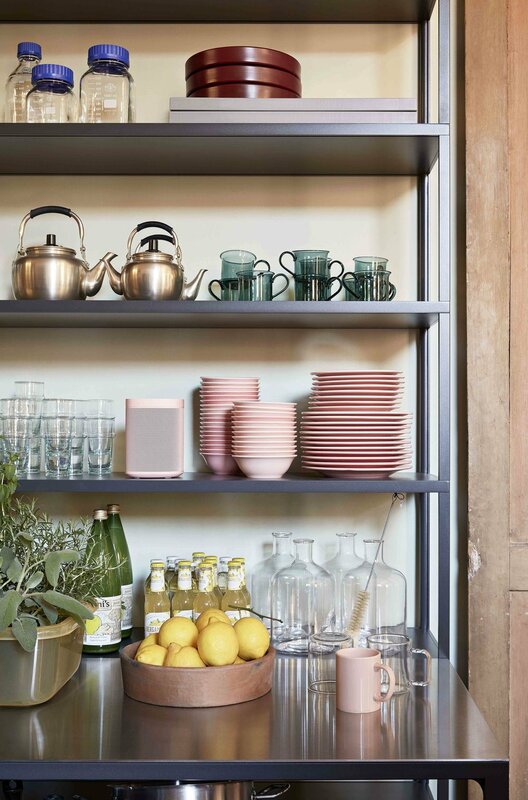 The new HAY Sonos One speakers are designed to make a statement in the home; the soft colour palette of these new speakers coupled with the signature Sonos design allows them to stand out or blend in as much as you would like. When we first saw the speakers earlier this year, we fell in love with the Forest Green shade and how much it reminded us of the house plants we all love to fill our homes with – they look good and make you happier; it’s a win-win! So I’m sure you can all imagine our excitement when Sonos invited us to choose a colour to style and share with you all. While all the shades are beautiful (the soft, lemony Pale Yellow option is a close second favourite) we were still drawn to that dark, Forest Green. So you’re probably wondering “okay, but why go for green if that pretty millennial pink one is on offer?” and the answer to that is: versatility. The dark green hue of the speaker will complement a wide variety of colours and design styles without being plain or uniform. The HAY Sonos One would look totally at home in an all-white Scandi-style home, focused on minimalism. It is also ideal for any boho-chic fan out there; simply pair it with other plants, macramé hangings and some reclaimed wood for a free-spirited, sophisticated look. While we love both of these style ideas and think they are so easy and accessible, we wanted to show you the real versatility of this new collection. So, after spending a few minutes (okay an hour) on Pinterest getting all of the colour inspiration you could ever need - take a look at the board here -, we headed out to local junk and antique shops on the hunt for a wooden cabinet. We found the perfect one for £40 less than an hour into the search and after some interesting car Tetris it was sitting in the corner of the studio ready to be transformed. Now, if you’re thinking “that’s all very well and good but the plants are going to ruin the sound from the speaker” then let us introduce you to Trueplay. Thanks to Sonos’ Trueplay feature, none of the sound will be lost because of the wall or plants; rather they will be used to ensure that a balanced sound quality is maintained around the room (pretty cool if you ask me). If that wasn’t exciting enough, the built-in Alexa app means you can interrupt singing along to “Shallow” from A Star is Born to ask Alexa to book you an Uber to the cinema (four cinema trips for one film isn’t too many, right?). The HAY Sonos One is available in Pale Yellow, Vibrant Red, Light Grey, Forest Green and Soft Pink and costs £229. Available to buy in store and online from 5th November.